The submitted article will be evaluated by reviewers for its contribution, originality, relevance, and presentation. The Editor shall then inform the author on the results of the review as soon as possible, possibly in six to eight weeks. 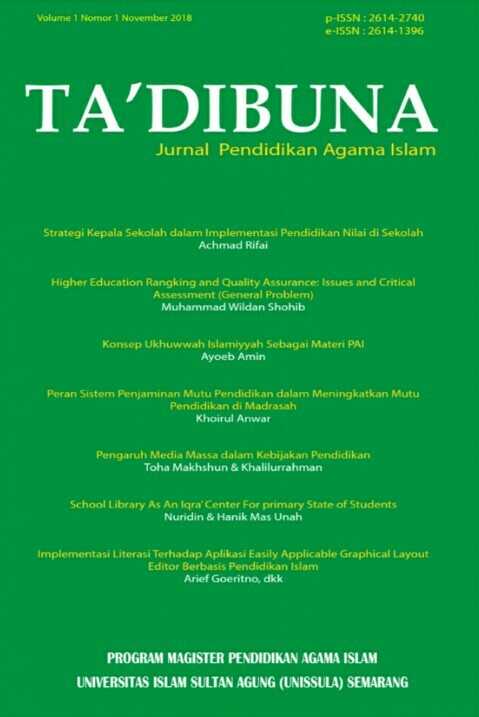 Ta'dibuna: Jurnal Pendidikan Agama Islam is published by Master Program of Islamic Education, Faculty of Islamic Studies, Universitas Islam Sultan Agung (UNISSULA), Indonesia. Contact us: Jl. Raya Kaligawe Km.4, PO BOX 1054/SM Semarang 50112. Email: jurnaltadibuna@unissula.ac.id.